Berger. EEG. Hans Berger. Epilepsy Museum Kork. 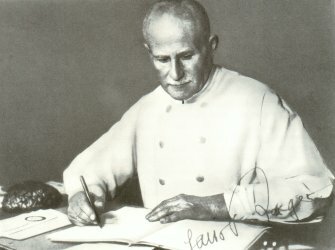 The German psychiatrist Hans Berger was the first person to prove the existence of electric potentials (voltage fluctuations) in the human brain using an amplifying machine (an electroencephalograph). The main problem in proving and recording human brain potentials was how to scan, measure and register the potentials, which fluctuated by only a few millionths of a volt (µV), through the closed skull cap. Fortunately for Hans Berger, the gardener's son had a serious accident which tore off a large part of his skull cap. The young man survived the accident, but his brain was now no longer covered by the bone of the skull but only by a thin layer of skin. As a result, it was much easier for Berger to measure the potential fluctuations in his first test person than it would have been in a person with an intact skull cap. Hans Berger, a grandson of the German poet Friedrich Rückert (1788-1866), was to have a tragic fate. He had to suffer the accusations and attacks of the Nazi rulers in Germany. His scientific work found far more recognition abroad than in Germany itself. Under more favourable political conditions, Hans Berger would most certainly have been awarded the Nobel prize for his epoch-making discovery. Dr. Hans Berger hung himself in his psychiatric clinic in Jena in 1941.